Not all plates are safe to put in the oven, and even plates labeled oven-safe may break unless you take precautions. Not all plates come with use guidelines. Vintage plates, hand-crafted plates and imported plates may offer no clue, and may present health risks in addition to the possibility of breakage due to temperature changes. Many manufacturers label the plates so you don't have to guess about their use guidelines. This labeling appears on the back of the plate, usually in or near the center. Some plates are labeled oven-safe, microwave safe and dishwasher safe. Others are microwave safe, but aren't intended for use in standard ovens or convection ovens. 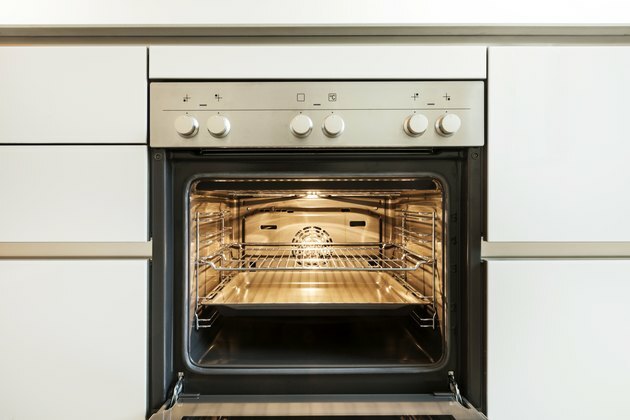 Even if a plate is labeled oven-safe, manufacturers often specify temperature limits, often recommending not heating the plate above 300 to 350 degrees Fahrenheit, depending on the plate's material. Manufacturer websites usually have use instructions that include safe temperatures for their plates. Glass plates, unless they are specifically labeled as oven safe or microwave safe, pose a risk of injury if heated. Antique plates can pose a special risk. Although post-1960 ceramic plates are generally oven-safe, some older ceramic and glass plates may contain radioactive materials. Red-orange Fiestaware, certain similar glazed items, and yellow glass colored with uranium known as vaseline or canary glass emit radiation. The U.S. Food and Drug Administration says not to use these items for food or drink, so keep these out of the oven. Any plate labeled decorative or "for decoration only" should not be used for serving food and shouldn't be heated in any type of oven. Usually their glazes aren't considered food-safe and may contain lead. Melamine plates are not oven safe and the FDA advises against using melamine in microwave ovens. Melamine is made from melamine-formaldehyde resin, and the melamine can contaminate food at 160 F and above. If a plate isn't labeled, especially if it's antique, vintage, handmade or imported, the safest course is to refrain from using it in any kind of oven. Older or imported stoneware, pottery and ceramic plates may have lead in their glaze, which can contaminate your food. 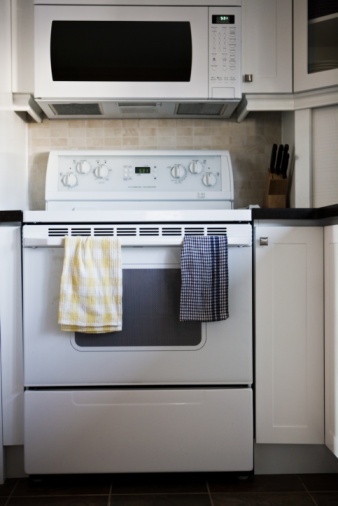 Even oven-safe plates should never be used in a broiler or in direct contact with any heating element, such as a burner. Sudden changes in temperature or contact with water or wet surfaces can cause a heated plate to break, even if it's labeled oven safe. Can You Microwave Ceramic Mugs? Can T-Fal Be Used on Glass Cooktops?